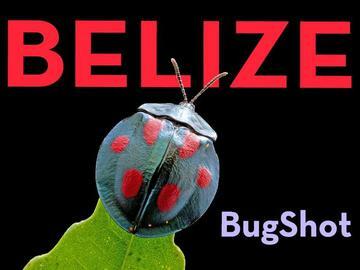 Join entomologists Alex Wild & Jo-anne Holley on an 8-day, 7-night tropical insect safari and photography workshop in Belize! [Click for a preview] SOLD OUT - contact Alex Wild (alwild [at] myrmecos.net) to be placed on the waiting list. Day 2. We cover the basics of macrophotography equipment and lighting, accompanied by practice in the botanical garden and a focus-stacking tutorial in the afternoon. An evening presentation will introduce insect biology, after which we'll take a walk through the forest to spot katydids, stick insects, and other nocturnal animals. Day 3. We travel to a nearby limestone cave to photograph amblypygids, cave crickets, and fungus gnats. The cave also holds Mayan relics. Back at the lodge we will hold tutorials on image processing, composition, and an after-dinner photo-sharing session. As usual, the blacklight will be running to attract night-flying insects. Day 4. A morning visit to the Caves Branch river will supply us with aquatic insects, including diving beetles and dragonfly nymphs, to practice photographing in studio aquaria. Later in the day we'll hold sessions on general entomology, insect behavior, and high-speed flash photography. Day 5. We travel 1 hour to the Green Hills Butterfly Ranch. In the morning we hone our technique amid swirling clouds of domesticated butterflies, including longwings, glasswings, morphos, swallowtails, and more. After lunch we'll try the more challenging wild butterflies along Green Hill's outdoor trails and gardens. In the evening, back at the lodge, we'll have a presentation on the science of rain forest ecology, followed by photo-sharing. Day 6 is unscheduled until dinner. You are welcome to sign up for one of Caves Branch's many adventure tours, visit Mayan ruins, continue shooting in the forest, or just lounge by the pool. Alex will be on hand all day to offer additional photography instruction or individual sessions. In the evening Jo-anne will hold a workshop on insect identification, followed by a photo-sharing session. Day 7. We remain on lodge grounds to practice our photographic skills on fascinating subjects like orchid bees, dung beetles, and acacia-ants. The day also includes sessions on how to find and collect insects, on digital workflow and online sharing, and discussion on a topic to be determined by group interest. We have a closing social event planned for the evening. Throughout the event, indoor insect studios and aquaria will be available for general use, and the blacklight/mercury vapor lamp will run every evening. Each day will also include short introductions to local insect species. Lodging: Spacious 4-person cabins are the default accommodations included with registration, but upgrades to doubles, singles or the super-luxurious Tree Houses may be possible at additional cost pending availability. Contact Alex as soon as possible if you are interested in alternate accommodation- Caves Branch is a popular destination and the cabins fill quickly. Price includes: All scheduled course activities, lodging, meals. Price does not include: transportation to/from Belize and to/from the airport, drinks from the bar, tours taken during the unscheduled day. Maximum enrollment is 12. As of 9/27 we have achieved the minimum enrollment (8) and can confirm that the event will proceed. Some attendees have reported trouble with PayPal during registration. If this happens to you, let Alex know ASAP. Your reservation can be held manually while we sort out payment via other methods.